Lawn Mowing | LawnPro Landscapes LTD. Proper mowing is one of the most important practices in keeping your lawn healthy. Grasses are like most plants — if you clip off the growing points (for grass, it’s in the crown, where the new leaves develop), the plants branch out and become denser, which in this case, turns thousands of individual grass plants into a tightly woven turf or a lawn. But the mere act of mowing isn’t what makes a lawn look good. Mowing height and mowing frequency determine how healthy and attractive your lawn looks. LawnPro Landscapes Ltd doesn’t just mow and go, we follow a strict process, each and everytime we come to your property. Using our state-of-the-art commercial mowers, trimmers and blowers we take whatever time it requires to make every lawn look good and healthy. Lawn Edging: Using a line trimmer, we cut around the perimeter of all lawn areas, making sure keep a consistant edge each visit. During this process we also cut grass in hard to reach areas the lawn mower wouldn’t be able to reach. At this time we also can remove debris or identify any lawn care issues (disease, pests, etc). Lawn Mowing: Using a push mower or ride-on we mow the grass at 2 1/2″ inches. The direction of mowing depends on the property, but will be consistant to give a professional and aestheticlly pleasing look. We never leave clumps of grass behind. Clumps of grass reduce the eye-pleasing quality of freshly cut turf, and suffocate the grass underneath. We sharpen our blades at least once a week. Sharp mower blades help the lawn grow healthier, and provide a crisp and tidy look. We continuously alter the cutting pattern. Over time, if the cutting pattern remains the same or is varied infrequently, unsightly grooves will develop in the lawn. We take great care to put a precise edge on all that gets trimmed. Blowing/Clean-up: After the mow we again walk your property and blow all loose grass clipping back onto your lawn. Includes patios, walkways, driveways and streets. By the time we’re fisnished, everything looks green and clean. Starting in Late March and ending in Late November (depending on weather conditions) we perform this service on a weekly basis on the same day each week. 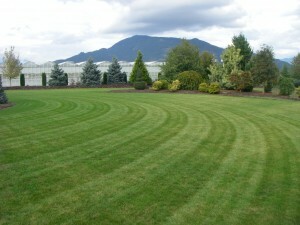 If we have to cut lawns twice in one visit, as we often do during the spring months, then we do so at no extra charge.